The tool aprates computes values and bounds for source intensity quantities (net counts, source rate, photon flux, energy flux) using counts and exposure data obtained in source and background apertures. aprates uses Bayesian statistics to compute the background-marginalized, posterior probability distribution for source intensity, assuming non-informative prior distributions for background and source intensity (for details on the algorithm, see the Background Marginalized X-ray Source Intensity memo). The posterior distribution can be used to determine intensity value and confidence bounds or intensity upper limit. The aprates tool is used in the srcflux script which automates the steps outlined in this thread. You want to calculate net counts, source rate, photon flux, and/or energy flux for ACIS or HRC data. This thread runs aprates multiple times - from computing simple net counts to computing energy fluxes with limits - each building on the previous aprates command. If you know which quantities to calculate, you can just set the appropriate parameters and run aprates once. Last Update: 11 Dec 2014 - Review for CIAO 4.7. Minor edits. CIAO also includes a script named srcflux that can be used to simply the extraction of fluxes and count rates. It makes use of aprates as in this thread and several other tools and scripts. This thread uses level=3 data products which were downloaded from the the Chandra Source Catalog. CSC data is not required to run the thread. This section explains both how to download data from the CSC and how to manually create the input files. 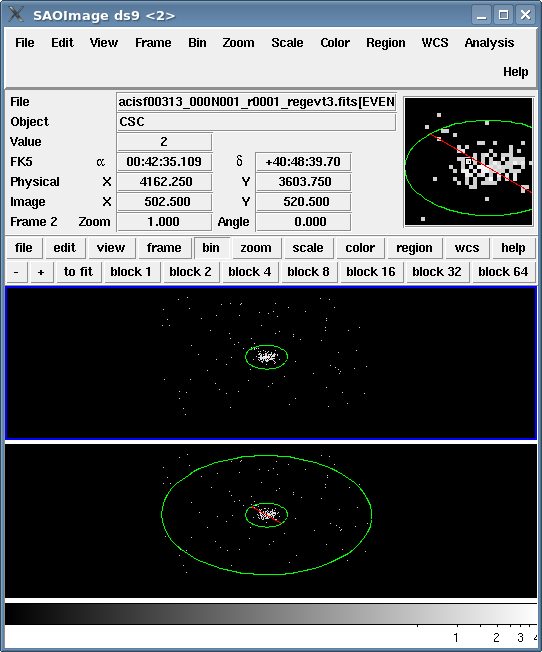 Launch CSCView, the CSC GUI. From the "Standard Queries" list, select "Standard Search Criteria → Search by Observation Identification" so that it is highlighted. Then click on the "+" on the right side of the "Search Criteria" box; an o.obsid field will be added to the search criteria area. Set the value of o.obsid to "313". In the "Source Properties" list, expand the menus "Source Observations → Detected Source Properties → Observation-Specific Identification Information". Select "region_id" so that it is highlighted. Then click on the "+" on the right side of the "Search Criteria" box; an o.region_id field will be added to the search criteria area. Set the value of o.region_id to "1". Make sure there is at least one property in the "Result Set", e.g. add "Master Sources → Source Name → name". Click "Search". The GUI will switch to the "Results" tab and list the results returned. Make sure the "broad [ACIS]" box is checked in the energy band section, then click "Search". The GUI will switch to the "Products" tab and list the filenames found. Click "Select All" to select all the files, then click "Download" to download a tarfile containing the data. This thread uses the reg3.fits file from the Chandra Source Catalog, but any FITS or ASCII region file may be used. For assistance defining and saving source and background region files, refer to the Using CIAO Region Files thread. If you choose not to download data from the CSC, you will need to make a PSF for the source and background positions before continuing. To make a PSF, run ChaRT. If you choose not to download data from the CSC, you will need to make an exposure map for the event file before continuing. To make an exposure map, run the fluximage script, as shown in the ACIS multi-chip exposure map thread. Be sure to make an unnormalized exposure map, as shown in the thread, so that it has units of [cm^2 s]; aprates expects the input exposure values to have these units. All the input to the aprates tool is obtained from the values set in the parameter file. That is, the tool doesn't read an event file or other data file to obtain the values. The input parameter values are determined by querying different data files before running aprates. unix%  dmtcalc file.fits out.fits expression="energy=1.6e-12*energy"
but the file, out.fits is never written to disk. The ds9 command-line options are used to display them on the data, as shown in Figure 1. The source region (top frame) is defined as an ellipse. The background region (bottom frame) is defined by two ellipses, the larger one excluding a smaller one to block any source counts from the background region area. Both regions are centered at (x,y)=(4164.807, 3602.933). A number of different CIAO tools can be used to determine the area and number of events in apertures. These tools may yield slightly different results, depending on whether one starts with an event list or image. Results from event lists are more accurate, since event locations are typically known to finer resolution that a pixel size, and areas can be determined analytically for simple apertures. For images, aperture counts and areas are determined from those pixels whose centers fall within the aperture. We recommend the use of dmextract if an event list is available. There are 141 source counts (n=141) and 9 background counts (m=9). The source area is 196.689 pixels (A_s=196.689) and the background area is 4720.50 pixels (A_b=4720.50). The PSF fraction in the source aperture is 0.953 (alpha=0.953) and the PSF fraction in the background aperture is 0.029 (beta=0.029). All the other parameters for aprates are set to a value of 1. The confidence region (conf) value is set to 90% (0.90). The output file will be named aprates_netcts.par. The tool is run with mode=h to suppress prompting for parameter values. The warning indicates that Gaussian statistics were used instead of Poisson statistics; the threshold is controlled by the max_counts parameter. The net counts value is 147.748, and the 90% confidence region extends from 127.286 to 168.334. The full output file, aprates_netcts.par, is included at the end of the thread. Note that while the output file contains entries for rates and fluxes, they are just the net count values repeated. By setting the exposure times in the source (T_s) and background (T_b) apertures, the net source rate and errors will be computed. The exposure time is 5977.74 s.
The net rate value is 0.0247163 ct/s, and the 90% confidence region extends from 0.0212934 to 0.0281601. The full output file, aprates_netrate.par, is included at the end of the thread. By setting the average effective exposures (in cm^2-s) in the source (E_s) and background (E_b) apertures, the net photon flux and errors will be computed. The average effective exposure in the source region is 2308338.2013 cm^2-s (E_s=2308338.2013) and in the background region is 2058975.0111 cm^2-s (E_b=2058975.0111). The net photon flux is 6.40e-05 photons/cm^2-sec, and the 90% confidence region extends from 5.51e-05 to 7.29e-05. The full output file, aprates_netflux.par, is included at the end of the thread. There are two options for calculating the net energy flux with aprates: using the average photon energies (in ergs) or using the average of photon effective exposure (in ergs/cm^2-s). By setting the average photon energies (in ergs) in the source (eng_s) and background (eng_b) apertures, the net energy flux and errors will be computed. The counts in the apertures are filtered from the file regevt3.fits file with the source and background regions. The energy range of the events is restricted to the broad band (0.5-7.0 keV). The event energies are first converted to ergs using dmtcalc, and the average event energies in the apertures are then computed using dmstat. The average photon energies in the source region is 2.56e-09 ergs (eng_s=2.56e-09) and in the background region is 4.27e-09 ergs (eng_b=4.27e-09). Note that when using this option for computing energy flux, both average exposure (E_s, E_b) and average event energy (eng_s, eng_b) must be input. All the parameters of aprates are set to the previously-determined values. The output file is named aprates_eflux.par. The net energy flux is 1.63e-13 ergs/cm^2-sec, and the 90% confidence region extends from 1.41e-13 to 1.86e-13. The full output file, aprates_flux.par, is included at the end of the thread. An alternate method of computing the net energy flux and errors is to set the average of photon energy/effective exposure (in ergs/cm^2-s) in the source (flux_s) and background (flux_b) apertures. This computation is preferable to the one using eng_s and eng_b because it more properly weights the contribution of higher energy photons, which, though few, may dominate the energy flux. The counts in the apertures are filtered from the file regevt3.fits file with the source and background regions. The energy range of the events is restricted to the broad band (0.5-7.0 keV). The event fluxes are first computed using eff2evt, then the average of this quantity in the apertures is found with dmstat. The average of photon energy/effective exposure in the source region is 9.80e-16 ergs/cm^2-s (flux_s=9.80e-16) and in the background region is 2.23e-15 (flux_b=2.23e-15). The net energy flux is 1.44e-13 ergs/cm^2-sec, and the 90% confidence region extends from 1.24e-13 to 1.65e-13. The full output file, aprates_eflux.par, is included at the end of the thread. 26 Oct 2011 added "opt=generic" to the dmextract command to avoid a warning from the tool ("WARNING: ignoring opt=pha1: extracting radial profile from sky column."). 25 Dec 2013 Review for CIAO 4.6. Added link to new srcflux script. Additional edits are likely. 11 Dec 2014 Review for CIAO 4.7. Minor edits.